The island of Tabarca is the largest inhabited island in the Valencian Community. Tabarca Island is administratively dependent on the city of Alicante and is, without a doubt, a symbol and tourist reference of the Costa Blanca Spain and the Mediterranean Sea. 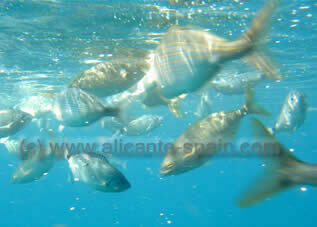 It is found less than 11 miles south-east of Alicante and only three miles from the cape in Santa Pola. With its 1,800 meters long and 400 meters wide, Tabarca offers a real refuge, ideal for a weekend getaway, especially in the off season when you can really enjoy the quietness and the absolute beauty of its landscapes. Tabarca, or sometimes called ‘Flat Island’ or ‘New Tabarca’ is an important receptor of tourism all year round but especially during the summer months when it can register up to about 3,000 daily visits. Its climate has an average temperature of 17 degrees centigrade. 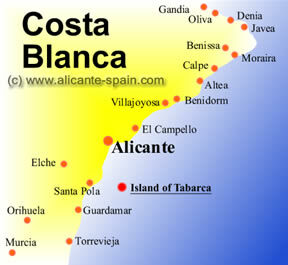 There are various maritime lines which connect the island to the mainland like Alicante, Santa Pola, and Torrevieja. Short journeys are done on a frequent timetable, depending on the season, and the trip only takes 60 minutes from Alicante and 30 from Santa Pola. Tabarqah, as it was known and getting its name from a Tunisian island, dates back to the XVIII century. In 1741, the king of Tunisia invaded the island and took as his prisoners the people living there, who happened to be Genoese ( Genoa, the north Italian city ) but later became the prisoners of the Sultan of Argelia. In 1768, Carlos III, king of Spain paid a fee and freed them. They stayed on to make the island a military lookout, especially from the pirates who used the island to attack the Costa Blanca. By looking at the Church of Saint Peter and Paul, you can get a good idea of what the Baroque style was like back then. Another architectural interest is the wall they built back then when wanting to fortify the island. The wall is laid out in ashlar stone masonry with arched entrances and royal knightly shields. In an area on the outskirts of the town towards one of the tips, you can see the tower of Saint Joseph which has the appearance of a pyramid with the top cut off. Obviously, its function was to serve as a vantage point. And in the centre of the town was the Governor’s House which has now been converted into a magnificent hotel. All this was declared a Protected Historic-Artistic monument in 1964. The island of Tabarca was later declared, in 1986, a Protected Marine Reserve, taking in over 1,400 hectares. This protection does not prohibit all kinds of water activities within the reserved area. Professional fishing is to be done with craftsmanship and sports fishing can be done with the correct permits. What is understandably prohibited is scuba diving and fishing, collecting of any kind of flora or fauna and any kind of sport where motors are used. As is to be expected, the most popular and best prepared fish dishes can be eaten here. 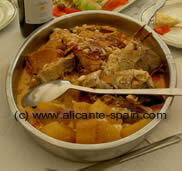 Here you can try what is called “ caldero ” or stewed fish prepared in a huge metal kettle or deep saucepan.Or fresh fish like red mullet, sardines or octopus in its ink. An then for a short nap or “siesta “ either on the beach or in the boat which takes you back to reality. Or you can continue on to other beach paradises like Benidorm, Denia or Calpe.